This article is part of a series of stories and op-eds launched by IPS on the occasion of the World Day to Combat Desertification and Drought on June 17. NEW DELHI, Jun 12 2018 (IPS) - As governments scramble for corrective options to the worsening land degradation set to cost the global economy a whopping 23 trillion dollars within the next 30 years, a humble grass species, the bamboo, is emerging as the unlikely hero. 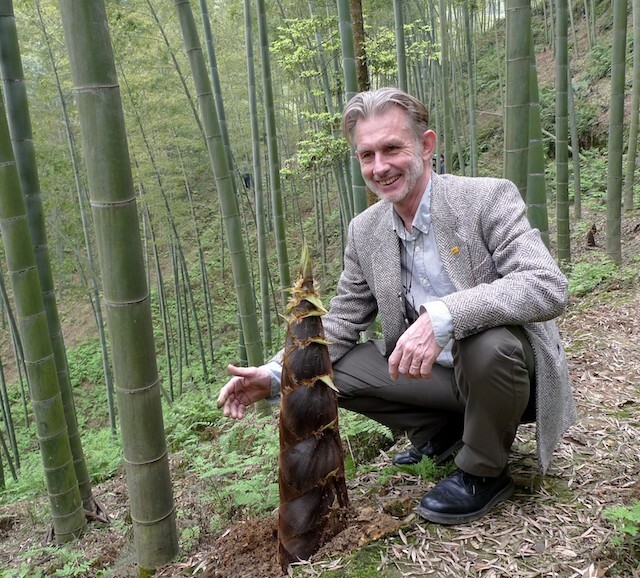 “Bamboo being grass, all 1640 species have a very strong root system that binds soil, and are the fastest growing plants making them best suited for restoring unproductive farmland, erosion control and maintaining slope stability,” Hans Friederich, Director-General of the International Network for Bamboo and Rattan (INBAR), told IPS from their Beijing headquarters. Bamboo is a strategic resource that many countries are increasingly using to restore degraded soil and reverse the dangers of desertification. “Our members pledged to restore 5 million hectares degraded land with bamboo plantation by 2020 for the Bonn Challenge in 2015. Political pledges have already exceeded the commitment and are today close to 6 million hectares,” Friederich said. “Planting on the ground however is much less , because nurseries have to be set up and planting vast areas takes a few years,” he added. INBAR, an intergovernmental organization, brings together 43 member countries for the promotion of ecosystem benefits and values of bamboo and rattan. Before joining INBAR in 2014, Friederich was regional director for Europe at the International Union for Conservation of Nature (IUCN). The Bonn Challenge is the global effort to restore 150 million hectares – an area three times the size of Spain – of deforested and degraded land by 2020, and 350 million hectares by 2030. Western Allahabad rural farmland under 150 brick kilns in the 1960s. The same farmland today revived by integrated bamboo plantations. According to the United Nations Convention to Combat Desertification’s (UNCCD) latest review released in May, to take urgent action now and halt these alarming trends would cost 4.6 trillion dollars, which is less than a quarter of the predicted 23-trillion-dollar loss by 2050. Globally, 169 countries are affected by land degradation or drought, or both. Already average losses equal 9 percent of gross domestic product (GDP) but for some of the worst affected countries, such as the Central African Republic, total losses are estimated at a staggering 40 percent of GDP. Asia and Africa bear the highest per year costs, estimated at 84 billion and 65 billion dollars, respectively. “Healthy land is the primary asset that supports livelihoods around the globe – from food to jobs and decent incomes. Today, we face a crisis of unseen proportions: 1.5 billion people – mainly in the world’s most impoverished countries – are trapped on degrading agricultural land,” said Juan Carlos Mendoza, who leads the UNCCD Global Mechanism, which helps countries to stabilize land and ecosystem health. In the 1960s, construction was newly taking off in India. 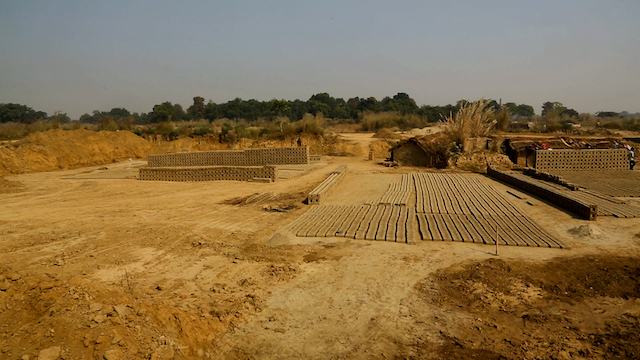 Brick kiln owners came calling at the 100 villages of Kotwa and Rahimabad in western Allahabad, a developing centre in central India’s Uttar Pradesh state. Rice, sugarcane, and bright yellow fields of mustard flowers extended to the horizon on this fertile land. Attracted by incomes doubling, the farmers leased their farmlands to the brick makers. Within a decade, over 150 brick kilns were gouging out the topsoil from around 5,000 hectares to depths from 3 to 10 feet. When the land was exhausted, the brick makers eventually left. Thousands of farm-dependent families sat around, their livelihoods lost, while others migrated away because nothing would grow on this ravaged land anymore. With the topsoil cover gone, severe dust storms, depleted water tables and loss of all vegetation became the norm. 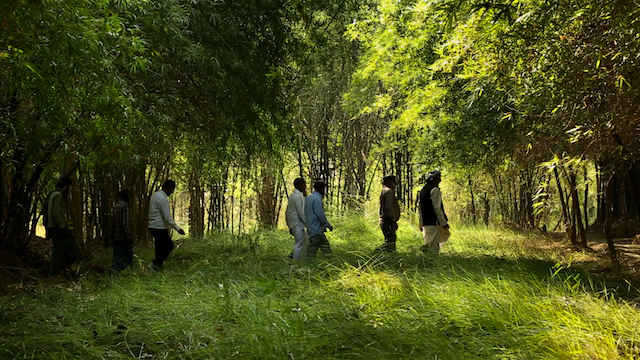 Starting bamboo plantations on 100 hectares at first in 1996, today local NGO Utthan with the affected community and INBAR have rehabilitated 4,000 hectares in 96 villages. Here bamboo is grown together with moringa, guava and other fruits trees, banana, staple crops, vegetables, medicinal plants and peacocks, oxen and sheep. Annually bamboo stands add 7 inches of leaf humus to the soil and have also helped raise the water table by over 15 metres in 20 years. 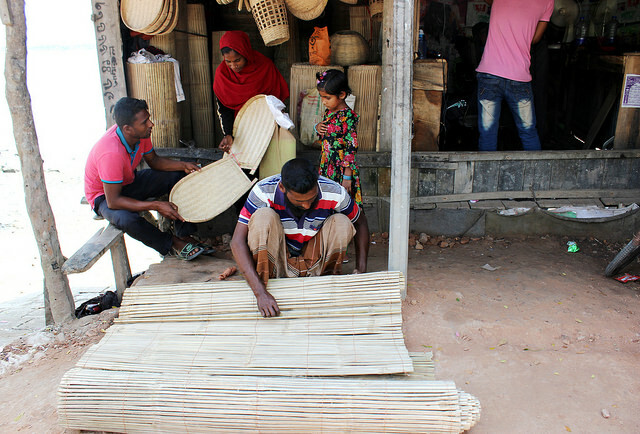 Selling bamboo adds 10 percent to the farmers’ income now. 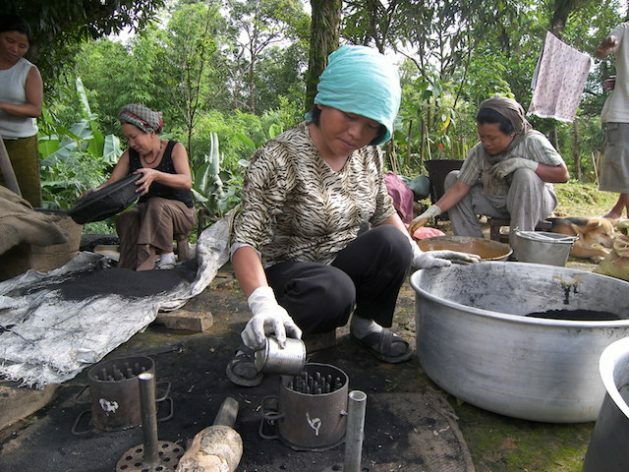 But the best benefit has accrued to women – 80 percent of cooking is done with biogas, not charcoal or wood. Much of the waste bamboo goes into biomass gasifiers that run 10 am to 1 pm powering 120 biogas generators at the NGO’s centres to keep refrigerators running, keeping vaccines and critical medicines safe during the regular power shortages. Today, bamboo and rattan are already among the world’s most valuable non-timber forest products, with an estimated market value of 60 million dollars. Rural smallholder communities are already benefiting by innovating beyond their traditional usages. “The more they benefit from this growing market of bamboo and rattan, the more they can become an integral part of conservation efforts,” according to Friederich, an explorer and bamboo enthusiast. He narrates to IPS how rural Chinese women have carved out economic opportunities, are being innovative and entrepreneurial with bamboo to reap rich incomes. After the devastating 1998 Yangtze floods and 1997 severe drought in the Yellow River basin, the Chinese government began a massive restoration programme afforesting degraded farmland with bamboo which today involves 32 million farming households in 25 provinces. Like millions of others, a woman in Guizhou province in central China made furniture out of the abounding bamboo available. As she expanded the business, the larger pieces of bamboo waste went into the furnace generating electricity and heating but the bamboo powder heaps grew mountainous. She experimented growing mushrooms on them – high value delicacies restaurants vie to buy from her today. The bamboo leaves are fodder for her 20,000 free-running plump chickens. A 2017 study shows fiber in the bamboo leaves enlarges the chickens’ digestive tract, enabling them to consume more and increase in body weight by as much as 70 percent more than chicken fed on standard organic diets. The dye in bamboo leaves the chicken eggs a slightly bluish tinge akin to the pricey duck egg. Consumers pay more for her blue chicken eggs. She’s not complaining. Her yearly earnings have grown to 30,000 million Renminbi or 5 million dollars. In Ghana again, a young woman manufacturing sturdy bamboo bicycles, employing and training local village girls who have few opportunities, is already exporting her innovation to Netherlands, Germany and the US. “Peru, Ecuador, Colombia and other earthquake-prone regions have changed building regulations to allow bamboo as a structural element. They have seen, after disasters bamboo structures may crack or damage but have not collapsed as often as concrete structures have,” Friederich said. Nepal is building 6,000 classrooms still in need of repairs post -2015 earthquake, with round earthen walls, and bamboo roofs which allow the building to flex a little bit even when the ground trembles. Besides housing, furniture, household items, bamboo can be used for a number of other durable products, including flooring, house beams, even water carrying pipes. But in a warming world, that bamboo as a very effective carbon sink is not as widely known. Because of their fast growth rates and if regularly harvested allowing it to re-grow and sequestrate all over again, giant woody bamboos (grown in China) can hold 100 – 400 tonnes of carbon per hectare. But bamboo’s carbon saving potential increases to 200 – 400 tonnes of carbon per hectare if it replaces more emissions-intensive materials like cement, plastic or fossil fuels, according to Friederich. Partnering with International Fund for Agricultural Development from its start, INBAR now has recently entered a strategic intra-Africa project with the UN organization, focusing on knowledge sharing between Ghana, Cameroon, Madagascar and Ethiopia, regions in dire need of re-greening. The Global Bamboo and Rattan Congress (BARC 2018), starting 25 June in Beijing will see this project kick-started, besides plenary discussions on bamboo and rattan’s innovative, low-carbon applications, and how bamboo has and can further support climate-smart strategies in farming and job creation. Exciting prospects. Great ideas to work with! !